Do you have a meeting coming up? Still looking for the perfect place to have it? The Education Center is OPEN and it is the perfect place for continuing education classes, small study groups, or group events. 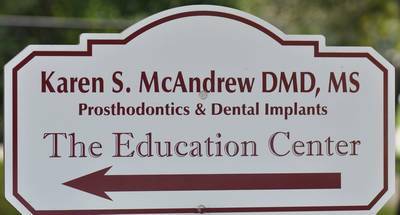 Dedicated to education and the pursuit of dental excellence, The Education Center at the Virginia Center for Prosthodontics is currently setting up the 2017-2018 education agenda. Founded in 2009, the focus of The Education Center is to bring people together from the local community and allow the exchange of knowledge and ideas with the purpose of building a solid community and foster the exciting interchange of ideas. Through learning and sharing we become a group involved in strengthening our community and pursuing excellence in our given discipline. The Education Center is equipped with full screen projection, an LCD projector, erasable easel board, and wireless internet services. It can be set for classroom or boardroom style lectures. Top quality continuing education brought to you in Richmond. No need to travel miles away from home and incur unnecessary expense. Please contact our office at 804-741-8689 or admin@drmcandrew.com for details. We will be posting Continuing Education classes that are being held at The Education Center in our quarterly newsletter and our website...keep an eye out for some very exciting CE being held in your own backyard!